1. Corrosion Resistant- Thermoplastic fluoropolymer coated stainless steel sheath for long life in almost all types of corrosive solutions for operating temperatures up to 212°F. Pin hole free, durable coating, 100% tested at factory. 2. Overtemperature Shutoff- Standard on all units. A manual reset cutout will deactivate the heater in the event of an overtemperature condition (rated 25 amps up to 277 volts). 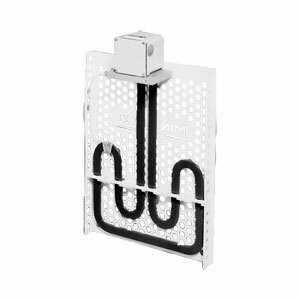 A visual minimum level indication is also provided on the heater guard. 3. Low Profile - Single and three phrase heaters have flat profiles which permit maximum work area and minimum interference with plating process. Heater projects less than 2" away from the side of the tank. 참고: To reivew heater certifications and listings please click on download under related links below.